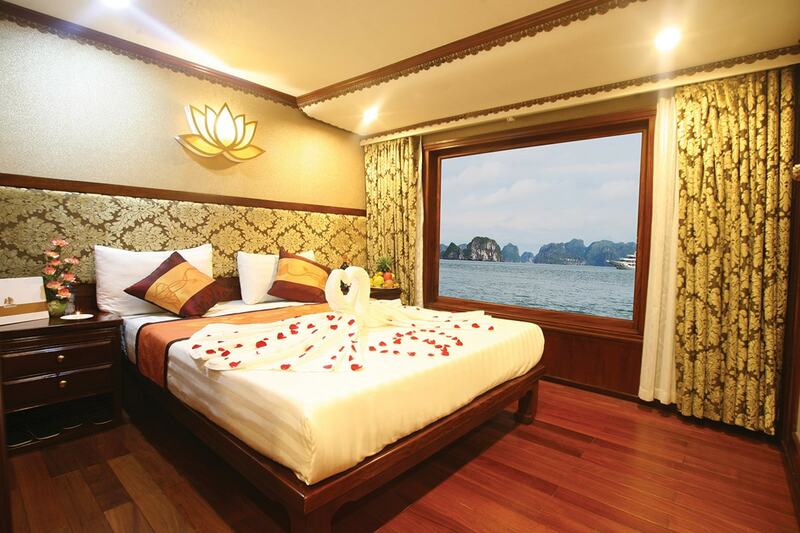 Including return international flights, all transfers, all hotel accommodation, an overnight Halong Bay cruise, daily breakfast, and more. per person twin share |	Typically $4,374! Experience some of Southeast Asia’s most spectacular gems, natural wonders and historic sites on an 18 day tour of Thailand, Vietnam and Cambodia. 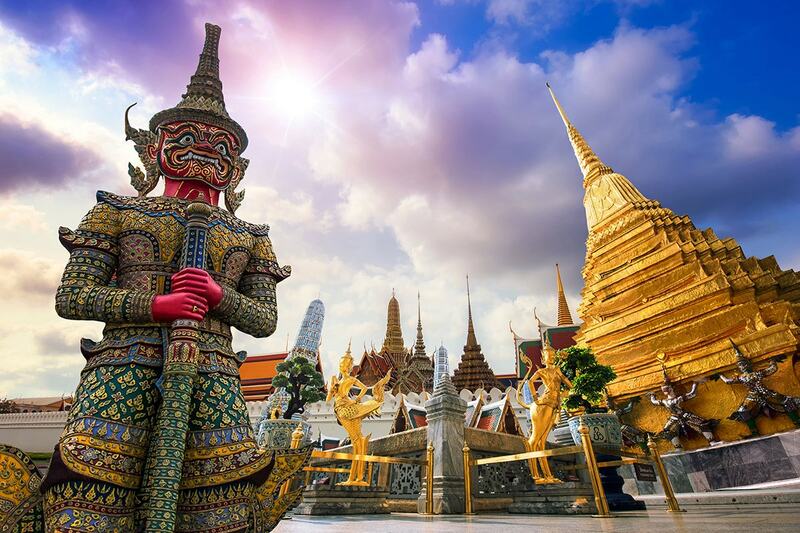 Fly into bustling Bangkok, the chaotic capital of Thailand that boasts world-famous floating markets, glittering royal palaces, mouth-watering street food, and sacred temples. A city and temple tour is the perfect launchpad for further discovery of Bangkok in your following day of free time. Journey out of the city to Kanchanaburi and walk across the bridge at River Kwai, and wander between ruins at the site of Thailand’s ancient capital, Ayutthaya. Fly to Hanoi, Vietnam and begin sightseeing with a city tour that will have you checking off landmarks such as Ho Chi Minh Complex and One Pillar Pagoda. 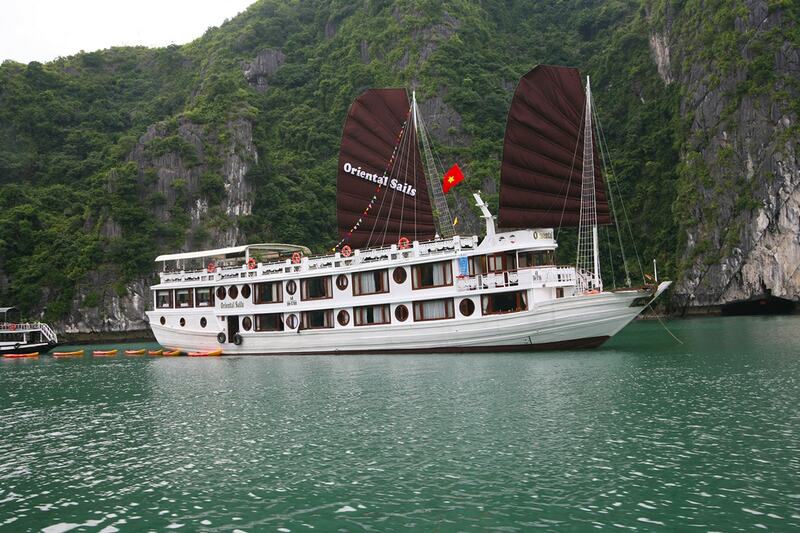 Move from the city to the coast as you step aboard a traditional Vietnamese junk boat for an overnight cruise in the UNESCO World Heritage Site-listed Halong Bay. 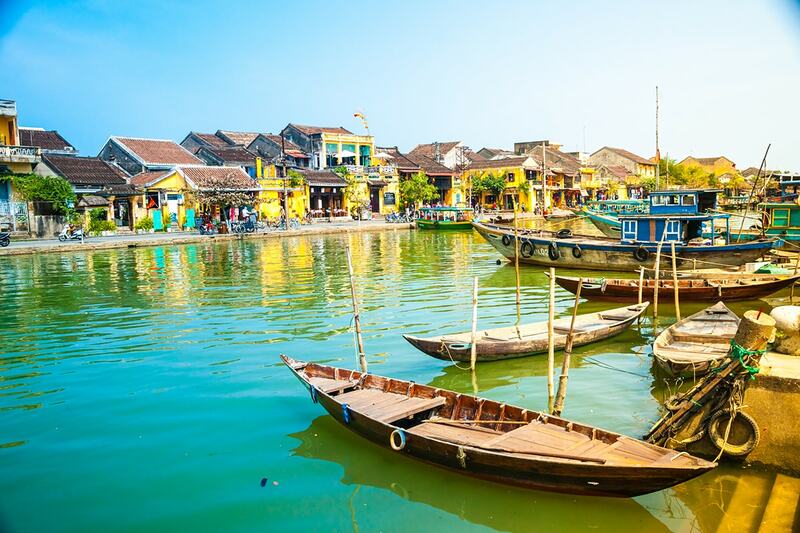 Continue towards picturesque Hoi An to discover its French-influenced architecture and pretty riverfront promenades and move further south to Ho Chi Minh City to take in its lively atmosphere and history, including the Cu Chi Tunnels site. Cross from Vietnam into Cambodia for the final leg of this incredible journey. 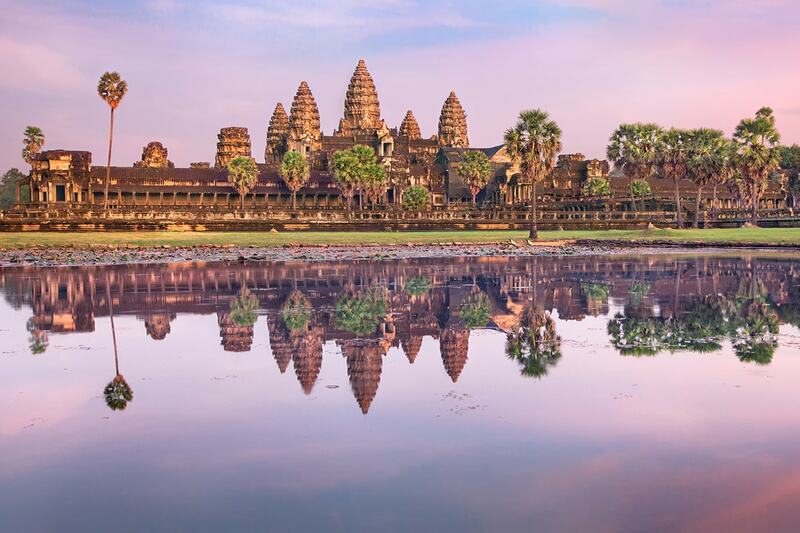 Experience a full day learning and marvelling at the tale of the temples of Angkor – Angkor Wat, Ta Prohm Monastery and the Elephant Terrace, plus more. 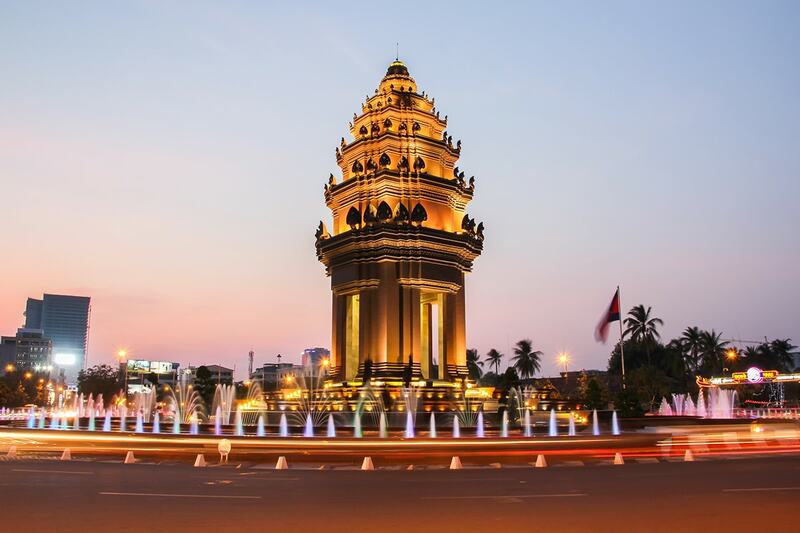 The tour wraps in Phnom Penh but not until you take in everything this beautiful city has to offer, from the Royal Palace to the Silver Pagoda. Day 1: New Zealand – – Bangkok. Board a flight heading to Bangkok, Thailand. You will be transferred to your hotel upon arrival. Enjoy a city and temple tour of Bangkok following breakfast at the hotel. This tour takes you through Chinatown and the Indian Market, and you will also see Wat Po, Royal Avenue and the King’s Palace. A free day to explore as you like. 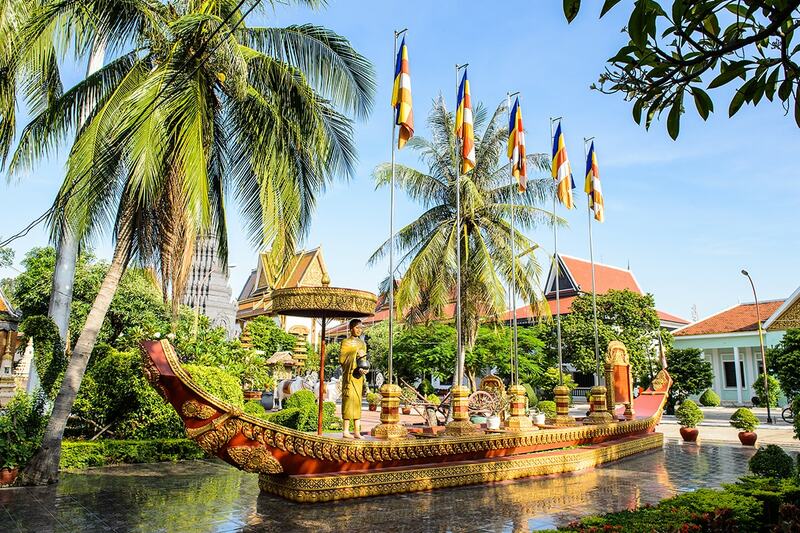 Visit Damnoen Saduak Floating Market this morning to take in this iconic fixture of Bangkok. The group then travels out of the city and to Kanchanaburi, a quiet provincial capital. 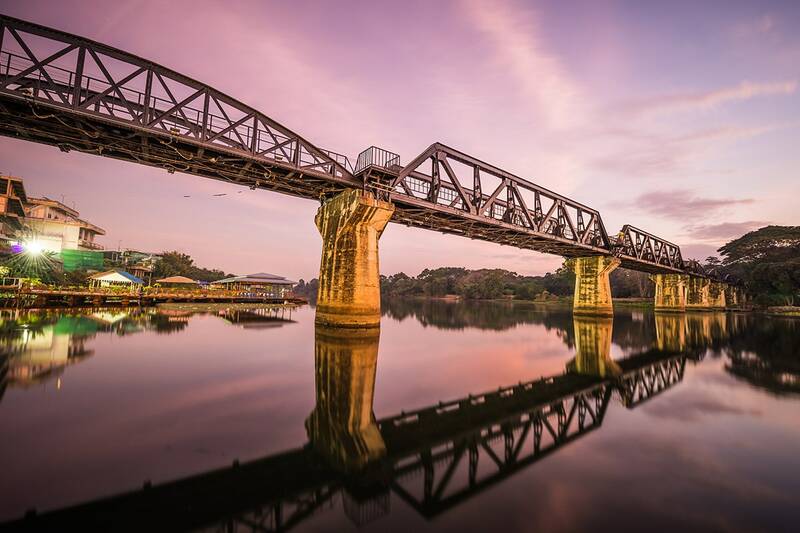 Here, visitors can walk over the bridge at the River Kwai, a recognisable site of the Burma Railway. This morning’s early start takes you to Ayutthaya, a former capital of Thailand (then known as Siam). It is now an important archaeological site where visitors can explore ruins and the remains of palaces and monasteries. Continue to Wat Chai Wattanaram temple after lunch and then head back to Bangkok in time to catch your flight to Hanoi, Vietnam. A transfer meets you at the airport and takes you to the hotel. Welcome to Vietnam! Get to know Hanoi on an orientation walk of the city that includes seeing the Ho Chi Minh Complex, One Pillar Pagoda and the Temple of Literature. Tonight, experience traditional Vietnamese folk music at a water puppet performance. 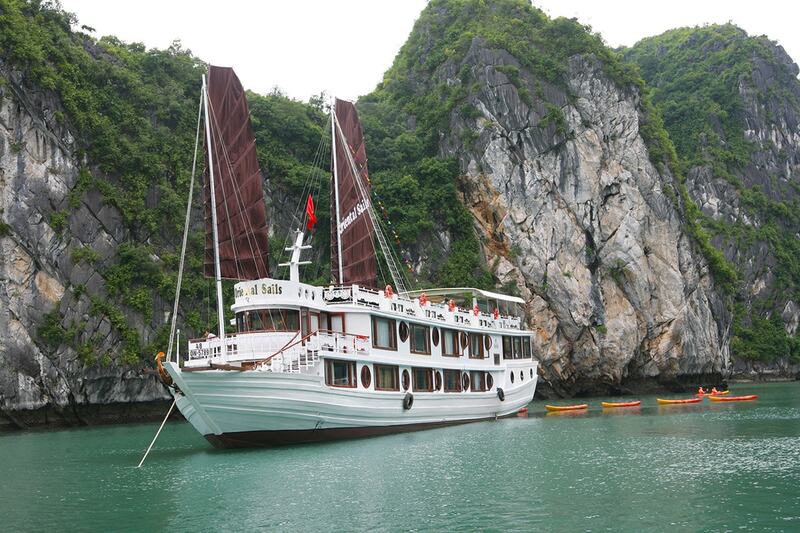 Journey through the rich farmland of the Red River Delta and arrive at Halong Bay. This location is a UNESCO World Heritage Site, famous for its limestone islands, caves and grottoes. You may also recognise it from the collection of sails, belonging to the Vietnamese junk boats that float atop the bay’s waters. Board your own junk boat and head out for your overnight cruise. Early birds can rise with the sun and practice Tai chi on the junk boat’s deck. 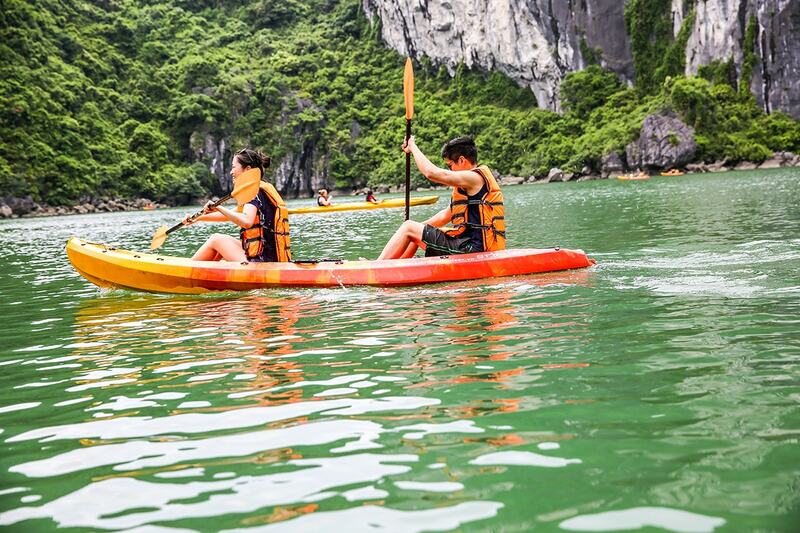 Then, explore some of the smaller islands around the bay in a rowboat. Breakfast and lunch are both served on-board. A driver meets the group at the jetty when it is time to disembark, and the group travels back to Hanoi in the afternoon. 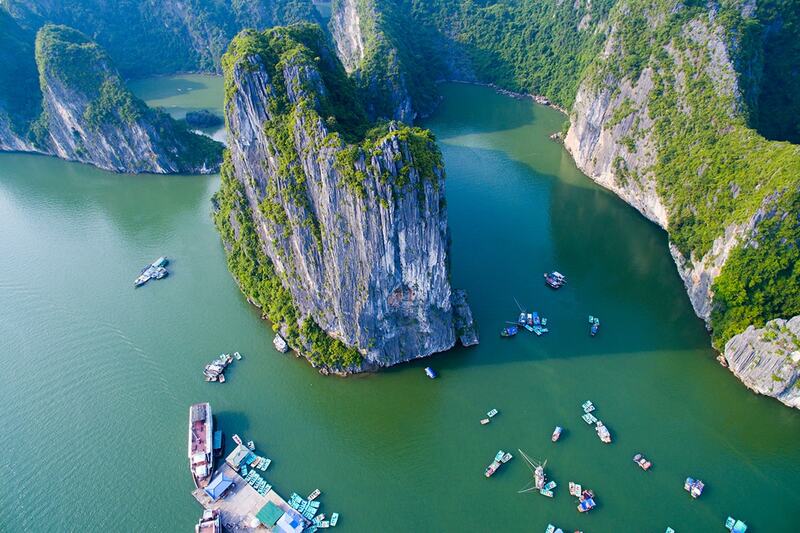 Take in the beauty of Halong Bay from a birds’ eye view with a scenic tour in a sea plane. Additional cost applies. Get a taste for the flavours of authentic Vietnamese cuisine on a food tour around Hanoi. This excursion includes dinner and fare sampled may include stuffed pancake and egg coffee. Additional cost applies. 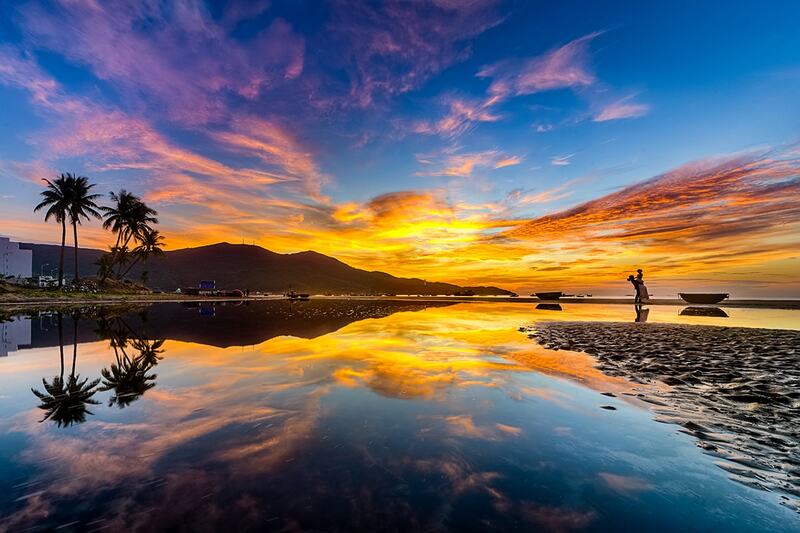 Board a flight to Danang and then drive to Hoi An. Explore Hoi An, an UNESCO World Heritage Site-listed town, on foot and visit its temples, ancient structures and covered Japanese bridge. Lunch is enjoyed at a local restaurant and this afternoon is free time. 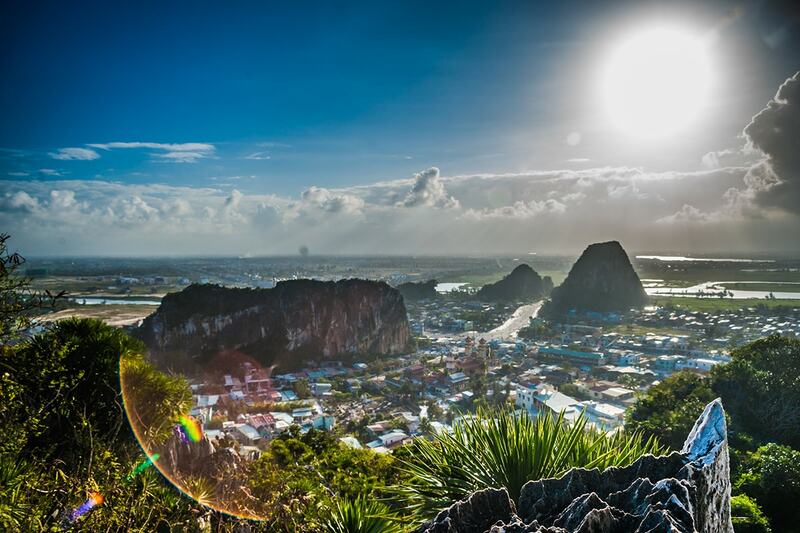 A transfer takes you from Hoi An to Danang and you then catch a flight to Ho Chi Minh City. A half-day tour of the city awaits once you are transferred from the airport and checked in at the hotel. Sights on the tour include Saigon Central Post Office, the War Remnants Museum and Ben Thanh Market. Travel to Ben Tre to get an insight into what life is like for the people that live alongside the powerful Mekong river. Stops on this excursion include brickworks, a coconut-processing workshop and the location of a family-run sleeping-mat operation. Lunch is taken at a riverside restaurant. There is also a rowboat journey along the river to Hung Vuong Pier. Visit Cu Chi Tunnels this morning. While here, you will learn about how this tunnel system was used by the Viet Cong during the Vietnam War. The group then heads to the airport and boards a flight to Siem Reap, Cambodia. A full day is dedicated to discovering the complex of the Angkor Temples. It begins by seeing Angkor Wat and continues at Ta Prohm monastery. 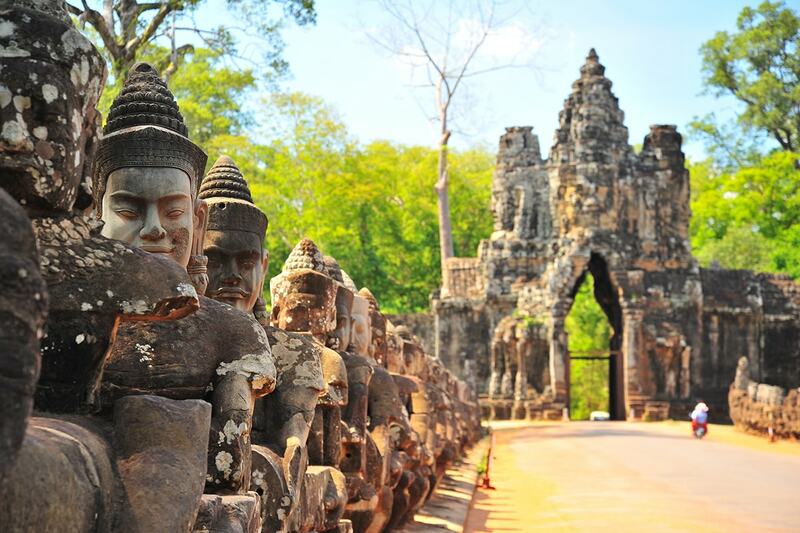 You will also see Angkor Thom, the famous Bayon, the Elephant Terrace and the Leper King Terrace. Travel from Siem Reap to Phnom Penh by bus. This drive takes you past farmlands and the Tonle Sap lake. Set out on boat excursion to see the lake and the fishing villages perched on its banks. This morning, take in everything Phnom Penh offers such as the Royal Palace, Silver Pagoda, National Museum and Wat Ounalom. Shop for souvenirs at the Central Market, watch a royal dance rehearsal at Aspara Arts Association, and learn about recent Cambodian history by visiting several Khmer Rouge sites. There is some free time before a transfer takes you to the airport and you board a return flight to New Zealand. A deposit of $199 per person are due at the time of purchase in order to secure your date. 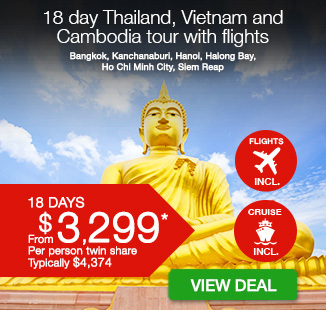 $864 per person in addition to the twin share voucher. Tipping: tips and gratuities are not included in the package and are at your own discretion (as a guide, approx. NZD $5-$10 per person, per day as per the industry standard). While not compulsory on your trip, tips can make a big difference to locals employed in the tourism industry. * Departures in February, March, April, October, November & December incur a peak season surcharge of $220 per person. Arriving early/Extending your trip: $220 per person (subject to availability and applicable fare difference). If you wish to alter or extend your trip, please purchase your voucher first and submit a request on your booking form. We will then provide quotations for any alternations or extensions. Should you wish to proceed any additional charges will be collected. However if you are unhappy with the options a full refund of the voucher will be provided. This fee does not include accommodation.